Edible Body Scrubs and Raw Desserts?! Our Maui EmBODYment Festival resident chef, Kyra is a health ninja who loves to nourish others with her delectable creations! A classically trained chef turned yoga teacher and raw food expert, her style is diverse and ranges from therapeutic live food to vegetarian California-Hawaii fusion to high-end farm-to-table cuisine. With years of event planning and front of house experience, her presence is warm and easily meshes with families, individuals, and groups of all ages, shapes, and sizes. She sees food as a way to share her soul with the world as she believes that through food we learn about spirituality, science, history, and our own unique bodies. Her goal is to inspire others to respect and LOVE the food they put inside of themselves, and to diminish the dogmatic judgment attached to health food advocates. She is the owner, founder, and head chef of More Pleaze. She has a Le Cordon Bleu degree from California Culinary Academy, a Wild-crafter Certification from Earth Medicine Institute is a RYT from Mangala Yoga, and is currently working towards a Holistic Nutrition Consultant through Hawthorn University. How did you get started as chef and what made you create More Please? Kyra: I never planned on being a chef. I went to a traditional culinary school, but I never had a desire to be stuck in a high stress, windowless kitchen for minimum wage and claw my way up. To me, food was about stories, sharing, and healing. I was more comfortable in the front-of-house in restaurants, where I could interact personally with people around food, even though I wasn’t preparing it. I would save up money waitressing and then spend months on end backpacking, exploring open-air food markets, and volunteering on organic farms, where I learned more about cooking and the energy of food than I ever did in culinary school. It wasn’t until I began teaching cooking classes that I found a way to combine hospitality and cooking. From there I began cooking for retreats and had a crazy dream that I might be able to make a living creating healing foods and supporting transformational gatherings through food. Tell us about your offerings at EmBODYment. Kyra: Every year that I cater EmBODYment I get to see how much I've grown as a chef and a teacher. My menu this year is a multi-cultural celebration of the edible abundance that Maui offers. Expect lots of bright flavors, rainbow food, and fusion dishes! For my workshops I'm leading an Edible Body Scrub Body Love workshop and my signature Raw Vegan Chocolate Cake workshop. What happens at an edible salt scrub class? Kyra: Living on Maui, it's become a tradition for my friends and I to make our own salt and sugar scrubs from household items and then scrub up on the beach. I've made tons of these scrubs casually, as well as use them ceremonially for events like birthdays, bridal celebrations, and Blessingways. These scrubs are the perfect way to practice self-love or create a beautiful community experience! What happens at a raw dessert class? Kyra: My raw dessert class is always so much fun! I try so hard to create a fun and interactive environment to learn about raw vegan food. But please know you DON'T have to be raw or vegan to appreciate this cake! I've presented this at countless retreats, and I always get the sweetest testimonials and images from participants after who really take this knowledge home with them! That's my ultimate goal: to inspire and empower participants instead of just cooking for them. What advice do you have for first year EmBODYment retreat goers? I just can't tell you how much I LOVE sharing my passion for food. It's such a magical experience to not only cook for guests, but to do it onsite a working organic farm with literal farm-to-table produce is a dream come true! Hale Akua is such a special place, and every time I cook onsite I fall more and more in love with the land. I can't wait to cook for you in paradise! 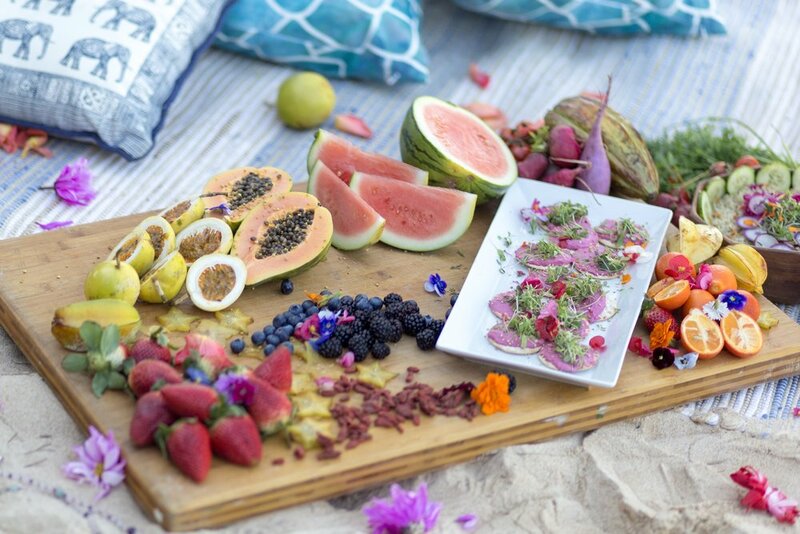 Come taste the magic of her nourishing, gorgeous meals and fun workshops at EmBODYment Maui! Amy’s returning to the EmBODYment Festival!